SMT stencils for PCB assembly feature fine pitch apertures cut on a high precision laser, smooth aperture walls for consistent and clean solder paste release and need to be designed, built and shipped rapidly. There are numerous advantages to the laser cut SMT stencil. 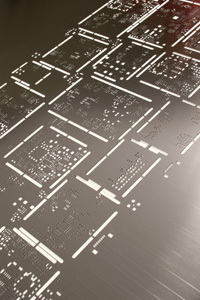 BEST uses a high nickel content metal as standard for its SMT stencil production. PHD high nickel content stainless steel us used as standard has greater strength and smaller surface grain structures than other stainless steels, producing a smoother wall with better release characteristics. This results in a consistently higher performing printing process. Lastly BEST knows what it takes to get projects done in a timely fashion. Its PCB rework and repair division and PCB rework tools division are under pressure to get projects shipped out quickly and accurately. BEST can deliver a variety of stencils including framed stencils, framless stencils or SMT prototype stencils. In order to get the best SMT stencil call BEST at (847) 797-9250.